It was a telling moment for the Coalition. Their economic message was so out of touch with reality that it had become a caricature of itself. Even one of their senior figures couldn’t tell the difference between actual Coalition policy, and what she thought was an absurd exaggeration. It didn’t need a scare campaign – the policy was a horror show all of its own. When it came to office, the Coalition were warning about a ‘wages explosion’. Six years on, and wage growth – by some measures is the lowest that it has been since World War II. Workers’ share of national income is near a 50-year low. Yet like a talking greeting card that still wishes you Happy Christmas in July, Cormann persists in warning that wage-boosting policies could cause ‘massive spikes in unemployment’. It’s pretty clear that whether wages were growing at 1 percent or 10 percent, the Liberals would be arguing that it wasn’t a good time to increase wages. Today, I want to argue to you that there is really only one party that occupies the centre ground in Australian politics – the Labor Party. When we look at three big policy areas – climate, wages and tax – the Coalition has given up searching for the centre, and become a party of pure reaction. The modern Liberal Party is looking increasingly like the party of Kevin Andrews and Tony Abbott than the market-based party of Robert Menzies and Malcolm Turnbull. The Liberal Party of 2019 is abandoning centrist economics, with its embrace of rationality, science and markets, in favour of a set of extreme views. The Liberal Party of Australia has adopted what US historian Richard Hofstadter called ‘the paranoid style’, in which conspiracies abound, crony capitalism flourishes, and diversity is a threat. It’s a populist approach to politics that is fearful of experts and internationalism, which urges us to hunker down. At its heart, it’s illiberal, which is why the government threatens to become a LINO party: Liberal In Name Only. That was 2009, and the leader of the opposition was Malcolm Turnbull. We know what happened next. Malcolm Turnbull lost the leadership of the Liberal Party over the issue of climate change – twice. The Coalition has now considered and abandoned nearly a dozen different climate and energy plans. As a consequence, emissions and energy prices have been rising since 2014. The strange thing about the Liberals’ stance on climate is that it’s not just grossly out of step with the science; it’s also perversely out of step with the concerns of the general public and the business community. In January this year, a survey of a thousand Global Business Leaders found that climate change was number one on their list of the gravest risks facing the planet. ‘Of all risks,’ they said, ‘it is in relation to the environment that the world is most clearly sleepwalking into catastrophe.’ Recent surveys of Australian company directors reach similar conclusions. The Reserve Bank has pointed out that continuing climate policy uncertainly poses a risk to macroeconomic stability. Military experts from the Pentagon to the Australian defence community recognise unchecked climate change as a risk to national security. So it has been left to Labor to occupy the sensible centre ground. We are committed to cutting pollution by 45 per cent by 2030. And we’ve set a target for 50 per cent renewable energy by 2030. Both these goals are based on Climate Change Authority advice on Australia’s fair share to achieve the goals of the Paris Climate Change Accords. Our approach is aimed at maximising the chance for eventual bipartisan agreement, investor certainty and the long term effectiveness of policy. Labor has consistently offered bipartisanship on this critical issue; and if we’re elected later this year, we plan to offer it again. Bill Shorten has said that he’ll sit down in his first week as Prime Minister and put the coalition’s own National Energy Guarantee back on the table. We don’t think the NEG is perfect. But we know that desperate for certainty and a policy that can work, every business group in the country supports it. If this fails, then Labor is going to deliver more renewable energy without the Liberals on board, by working with industry to directly support renewable energy investment. But regardless of where the Liberal’s end up on energy policy, we’ll move the country forward on tackling climate change. We’ll modernise our energy networks, and link up Renewable Energy Zones to the grid, supported by our $5 billion Energy Security and Modernisation fund. We’ll provide the Clean Energy Finance Corporation with an additional ten billion dollars of funding over five years for investments to support the transition to a clean economy, including in renewable technology such as a national hydrogen strategy. We’ll set a target of a million new household battery storage systems by 2025, and half of new vehicles sold being electric by 2030, and put in place sensible measures to smooth the transition for vulnerable workers and communities. We’ll reinvigorate the carbon farming initiative and develop a well-functioning offset market. For big polluters, extend the existing pollution cap, and allow for international offsets and potential electricity sector offsets. These measures aren’t radical, they’re mainstream. In Britain and New Zealand, the past decade has seen conservative governments implement sensible and effective climate change plans, grounded in solid science and sensible economics. They have shown what is possible when climate change stops being a partisan issue and becomes a national priority. By taking a sensible, tailored and cooperative approach, a Shorten Labor Government will aim to deliver the same. For many employees, work has become increasingly fragile. Collective bargaining is on life support. Union membership rates are as low as they have been since 1904. As Maurice Blackburn’s own Josh Bornstein has pointed out, a minority of Australian workers now enjoy permanent, full time employment with access to sick leave and holiday pay. Scandals such as the 7-11 wage theft affair seem to have become sadly commonplace. Shortsighted businesses think that they can have well-paid customers and poorly-paid workers. Wise businesses recognise that customers and workers are the same people. A pay rise for middle Australia is just what the economy needs to get retail sales out of the doldrums. That’s why Labor has proposed to restore penalty rates, and implement a Tradie Pay Guarantee. For labour hire firms, we’ll institute a principle of ‘same job, same pay’, and we’ll engage with the Fair Work Commission to develop a living wage. From the Coalition, we’re yet to see a single wage policy. A few years ago, their budget was projecting 3½ percent wage growth this year. It’s come in closer to 2½ percent. Yet when you look at their budget papers, they’re again forecasting 3½ percent wage growth. Hope isn’t a game plan. In the 1970s, we had a consistent period in which wages outpaced productivity. Back then, the sensible centrist position was to acknowledge the ‘real wage overhang’, and develop policies that brought wage growth back into line with productivity. 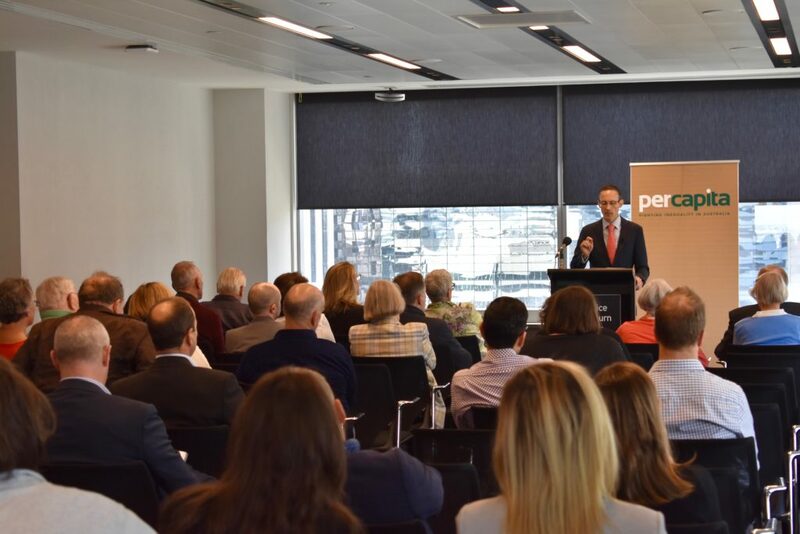 Within weeks of the Hawke Government winning office, Labor held an economic summit with business, trade unions, churches and welfare organisations. That consensus helped to sustain the Accord, with its focus on stability, equity and full employment. Today, we don’t have a real wage overhang. Over the past six years, wages have fallen below productivity. It should be uncontroversial to acknowledge that Australia has a ‘real wage underhang’. The centrist position today is simple: Australia needs a pay rise. Finally, let’s talk tax. When I was studying public finance, one of my professors was Martin Feldstein, Ronald Reagan’s chair of the Council of Economic Advisers. Feldstein emphasised the importance of reducing what he called tax expenditures, or call tax loopholes. Doing so, as he points out, raises revenue more efficiently than increasing tax rates. But in addition, tax expenditures tend to be much less fair than budgetary expenditures, so closing loopholes is much more equitable than cutting spending. That approach has informed Labor’s tax philosophy over recent years, as our economic team has made a number of politically challenging decisions to close tax loopholes. We’ll prospectively restrict negative gearing to new built homes, ensuring that that particular tax concession helps add to housing supply. We’ll prospectively halve the capital gains tax discount from 50 to 25 per cent. To address unfair income splitting, trust distributions to adult beneficiaries will attract a minimum tax rate of 30 per cent. For people who don’t receive a pension or allowance, we’ll end cash refunds of dividend imputation credits for people who paid no tax. In the company tax system, we will prevent multinationals using excessive debt deductions to unfairly lower their tax burden. Firms doing business in a tax haven will have to disclose that fact to their shareholders as a material tax risk. To listen to the Coalition describe Labor’s tax plans, you’d think that they’re the end of the world. In January, the Prime Minister issued veiled threats that a Labor win would plunge the economy into recession. Since figures last month revealed that Australia under the Morrison Government had experienced a per-capita recession, he seems to have stopped making that claim. Still, we should expect plenty more hyperventilating hyperbole about Labor’s tax reforms between now and polling day. How do we judge the sensible centre on tax? One starting point is to look at KPMG’s post-budget analysis, released last week. They plot the tax to GDP ratio for Australia, showing that since 1990, the figure has fluctuated between 20 percent and 25 percent. The highest tax to GDP ratio in the past generation was under the Howard Government. The lowest tax to GDP ratio in recent decades was under the Rudd Government. At the end of the graph, KPMG shows two futures: the government’s planned trajectory, and an alternative trajectory that assumes that Labor wins and all our tax policies are enacted. There’s barely a whisker of difference between them. Under Labor, KPMG projects the tax to GDP ratio to still remain below its level in the Howard era. Another approach is to look internationally. KPMG compares Australia’s tax to GDP ratio with 19 other advanced countries. We come in the fourth-lowest in this group. As they sum up the result, ‘Recent OECD and IMF data suggest that Australia’s government revenue levels are towards the lower end of the range achieved by comparable countries’. Only Ireland, Korea and the United States have a lower tax to GDP ratio. Japan, New Zealand and the UK have considerably higher tax ratios. In Belgium, Denmark and France, the tax take is 1½ times larger than in Australia. KPMG then re-estimate the figures assuming Labor’s policies are fully enacted. Australia’s ranking doesn’t change. We remain the fourth-lowest taxing of the twenty advanced nations in the pack. The more you look at the Coalition’s fear campaign on tax, the more it begins to unravel. Australia is unique in the world in providing cash refunds for dividend imputation credits. Removing these payments brings Australia into line with every other country on the planet. No-one will lose a dollar of their superannuation. No-one will pay a dollar more tax. Pensioners will not be affected. Similarly, Labor’s negative gearing policies will bring Australia into line with places such as Britain and the United States, which do not allow taxpayers to deduct investment losses from wage incomes. These changes do not affect existing investments, which are fully grandfathered. Reform of this kind was advocated by Joe Hockey in his valedictory speech. Likewise, Labor’s trust reforms build on changes instituted in the early-1980s by then Treasurer John Howard, to avoid the abuse of trusts for income-splitting purposes. Hardly radical stuff. With net debt having doubled since 2013, Labor believes that high-income earners should make a greater contribution to paying down debt. That’s why we will restore the top marginal tax rates to the level that Tony Abbott put in place from 2014 to 2016. From the Coalition, we sometimes hear that top tax rates are so punishingly high that entrepreneurs won’t locate in Australia. Yet figures last year showed that Australia attracted seven thousand millionaire migrants, the highest figure of any country in the study. Singapore, despite having a top marginal tax rate that’s half has high as ours, attracted one-seventh as many millionaire migrants. Going back to Tony Abbott’s top tax rates will not change the fact that Australia is a highly attractive destination for highly-paid workers. A few years ago, I wrote a book called Choosing Openness, about the rise in populism and the risk it poses to globalisation, engagement and internationalism. In an environment of rising inequality and rapid technological change, populists can prosper by telling voters that the answer is to hunker down in the face of difference, rejecting the benefits of trade, migration and foreign investment. These populists reject the idea of challenging choices and tricky trade-offs. They’d rather inflame than inform. As satirist Henry Mencken once put it, ‘there is always a well-known solution to every human problem – neat, plausible, and wrong’. As our political opponents become increasingly shrill and extremist, the challenge for Labor is to recognise that we cannot fight firebrands with fire. Angry politics is more likely to fuel populism than stem its rise. When the facts are on your side, there’s no need for exaggerated evidence or character assassination. Labor can draw on our unity and consistency over the past six years – a period of policy development unrivalled in recent Australian history. While the Coalition has had more reshuffles than a casino card dealer, Labor has used stability to build a long-term economic agenda. Stephen Long and Michael Janda, ‘Why are Australian workers getting the smallest pay rises since WWII?’, ABC Analysis, 28 Mar 2019. ‘Business puts climate change top of risk list’, AFR, 22 Jan 2019, p. 9. Foreign Affairs, Defence and Trade References Committee, 2018, Implications of Climate Change for Australia’s National Security. Parliament of Australia, Canberra. Josh Bornstein, ‘Small workplaces and corporate profit are driving wage stagnation’, ABC Opinion, 26 March 2019. Rebecca Huntley, 2019, Australia Fair: Listening to the Nation, Quarterly Essay 73, Black Inc, Melbourne.